The former Vice President threw down the gauntlet today, challenging the United States to produce 100% of its electricity with renewables such as solar or wind power, within 10 years. He likened the speech to President John F. Kennedy’s moon challenge in May of 1961. We landed on the moon in less than a decade, but is Gore’s goal too audacious? Is Gore relevant? Is anyone listening to him? Should we listen to him? It's about time that someone steps up and says that we can and should strive for this type of effort to happen in a short time. Why is it that politicians are always targeting a partial solution by 2050? Most of our leaders won't be around anymore by then and so it will simply be someone else's problem as far as they're concerned. Someone else commented that our infrastructure, the fact that our leaders are owned by Big Oil, etc. will prevent this. While this is not inaccurate, the only way we'll ever get anywhere with this is to put in the effort. While we all sit around and watch and listen to our esteemed president as he hems, haws and makes excuses as to why it's more important to drill more oil and come up with other fuels that we can burn, nothing happens. So, it is time for someone to do something! We can't fix the problem over night. No one, Al Gore included, is saying that we can flip some magic switch and all of the problems will go away. We're stuck with oil and coal and all this other crap for years to come. But we can start lessening our dependence on it as soon as today by making smart and practical choices rather than selfish and convenient ones. Let's stop subsidizing the oil companies. Let's fine companies who are not cleaning up their energy production facilities (none of this stupid Cap and Trade garbage... actual, honest to goodness fines that we do not allow them to pass on to consumers in the form of surcharges). Let's create jobs in manufacturing of solar panels and wind turbines. Let's create jobs in research labs to find newer, better, more efficient and less polluting ways to manufacture solar panels and batteries and all the related things. Sadly, Al Gore tends to draw out a lot of people who love to hate him. Even people who don't necessarily disagree with his climate ideas hate him as a person. Those who disagree with his climate ideas are even louder. But this isn't about Al Gore. This is about smart energy. It's about the future environment. It's about national security. We've done big, impossible things in short amounts of time before. We can do this, too. It just takes someone in a position of leadership to pony together enough courage to stand up and say "Enough!" and do something about it. I, for one, hope that someone heeds the call and does so. The solar panels on my home's roof are great and my home is nearly a zero carbon footprint building now, but it will take more than that to accomplish what needs to happen in the larger community. Instead of fighting about it, we should at least start to try to do something. Anything. I agree with Al Gore 100%, see the biggest problem in this global warning and energy crisis is that everyone is looking for an easy quick fix. That will never happen, people need to wake up and smell the coffee, unless we set a timeframe things will NEVER HAPPEN. We will keep rejecting every idea beause it wont fix everything immediately or its too expensive. Burning fuels for energy is old time technology. Public transportation is the present and the future. In USA we are behind on both of these. We have had decades to do better, and we have not. Gore's Challenge voices what we all know to be true. We must all work on this, tirelessly. This was exactly the same proposal Mike Huckabee made during the Republican primaries and the media scoffed at thim, saying it was "unrealistic." Hello, Al Gore is a politician, not a scientist. I wish he would just go away. Yes, I would like to see us move to renewable sources of energy. But I am getting bored of listening to his blathering. Gore is an idiot. His "Save the Planet " Crusade, depends on the willing cooperation of the global general public. If the public doesn't cooperate (and several billion people and many countries won't ), what's he gonna do? Put a gun to everyone's head? Bite me Al. We've got guns to. CNN: the question:"is Al Gore relevant" is entirely irrelevant! Please embrace the message and put it in capitals "BREAKING NEWS" -THE GOOD KIND!- on the TOP page of your website, instead of tucking it away somewhere down. Implied is: don't shoot the messenger, thereby playing down the groundbreaking challenge he lays down for all to contemplate. Mr. Gore's message is clear, undisputably thoughtful, and his challenge is up there as for the inspiration of a true leader. I'm astounded that CNN is not picking up on this great kind of "BREAKING NEWS" –isn't that what you advertize repeatedly? I would think that Miles O'Brien and his team could be spending 24 hours a day, over the nex ten years, on this global challenge alone, especially from their perspective –report on scientific fact without downplaying what is essential truth, let alone sensationalizing it! After all, let's be reall, CNN is blessed with having their medial facility, and may I suggest to use it wisely! Thank you for your consideration of first paying deference to your audience -as CNN -"THE MOSTED TRUSTED" in news should be doing- rather than to your advertizers. Al Gore's speech was an excellent clarion call to arms on the need to take bold action on an array of problems surrounding energy, climate change, and ecologically sustainable global economic growth. That having been said, I think that it was a tactical mistake for him to omit mentioning any form of carbon-free nuclear power as an integral component of a whole portfolio of energy technologies that must be utilized to help solve these problems. In particular, there is a new type of nuclear energy technology that truly has the promise of being clean, green, and potentially low-cost. Unlike fission and fusion, which are based on what physicists call the "strong interaction," this new, little-mentioned technology is based on the "weak interaction." It is called Low Energy Nuclear Reactions or LENRs. It has radical advantages (no dangerous radiation and no radioactive waste) over nuclear fission and "hot" fusion technologies. However, this is a very disruptive technology in that it potentially threatens many vested interest groups in multiple industries all over the world, such as battery and fuel cell manufacturers in the near-term and in the long term, the oil industry. Just hit the Google and Yahoo search engines if you wish to learn more - Lewis Larsen, Lattice Energy LLC. Someday, people will look back at he time when we burned fossil fuels for energy and think how primative that was. I hope that day is sooner rather than later. Everyday, the Earth is bombarded with enough sunshine to meet the world's energy needs several times over. It's available in the form of solar, wind and hydro energy. But today, we explore, drill, transport, refine, transport again and then burn in a complicated, inefficient and polluting engine. We can do better than that. The Reverend Gore is irrelevant. Everyone agrees that alternatives to oil are inevitable. So in the meantime can we all move in with Al? Will he drive us to work in his SUV? The Great Goracle, like most liberals, do not understand that free market forces will drive the change to alternatives. The government needs to get out of the way. I don't think the answer is to wait for reform from Congress. It has to be more grassroots. How many who have posted comments ride a bike to work, use mass-transit or carpool? This can't be the government taking action, it has to start with each of us making a decision to change our dependence on carbon-based fuel. Feel free to wait for change, or start now by making a change. Forget about the messenger and think about the message. This is America's second oil crisis, the first being in 1974. President Carter gave a speech in 1977 addressing the very same things that Al Gore is now proposing. Our country has done nothing of significance to address our reliance on foreign oil for over 30 years. As the saying goes "the best time to plant a tree is 10 years ago; the next best time is today". This country MUST do something today. If we wait for a third crisis, then it will be too late. The time to act is now and we must do it within 10 years. Gore is just the messenger, but his message should prompt us to act. His speech yesterday showed great determination and leadership to resolve this problem. One of the after market transmission maker's need to make a kit to replace a normal transmission with an "electric hybrid transmission". That is a 1-2 speed transmission. With a built in electric motor. That way you just replace your old transmission. Hook up the needed electronics to keep old engine from running till you hit 35-40 mph. And your set. Now all you have to do is go out and buy a few deep cycle batters. And as long as the kit is "BYOB" kit. (Buy your own batters) They could keep it to a resionable price. Don't listen to Al Gore, CNN, the pundits or for that matter anyone else, and please don't listen to talk show hosts claiming to be news men & women. Read the science for yourself and make your own determination if the situation is as grave as it is portrayed. Check out the IPCC reports at http://www.ipcc.ch/ These were developed by the worlds top experts. Your kids, neighbors, friends and loved ones deserve the short time it takes to learn the science. In order to be completely independant from oil we must first reduce our dependency by half. However, to reduce our dependency by half we must first reduce it by one quarter. As there are an infinite number of these half steps we must take to get to the goal, we can never reach the goal. So why even start? Also, to start there are a number of tasks we need to do; to complete any one of them we need to complete half of it; since there are an infinite number of these half measures, we can never actually get started. So we can neither start nor finish. Therefore, doing nothing is the best we can possibly do and that should make us happy, right? To compare Gore’s challenge to that of John F. Kennedy’s moon landing pledge proves that Gore suffers from illusions of grandeur. Instead of making America more prosperous, Gore wants to bankrupt the American people to fill the pockets of his environmental cronies with money. “Investment” is the Orwellian name Big Government politicians use for tax. His so-called investment is effectively a tax hike that will cost Americans more than $3 trillion! The worst part is that Gore challenges the American people to meet his climate goals in 10 years. However, we are not allowed to build more nuclear power or drill for domestic oil!! It is impossible to accomplish what he has proposed without denying most Americans automobiles and reliable electricity. If Al Gore and his alarmists really cared about the American people and wanted to lower our gas prices, they would not handicap our ability to produce domestic sources of energy. Al Gore… I mean what can I say the man is a hypocrite, but his ideas are a step in the right direction. That fact that he does not practices what he preaches doesn’t discredit the fact that the United States needs to reduce its dependency on non-renewable resources. Not just oil but all non-renewable resources. It is easy to see that if change is going to happen, now is the time. First step would be to produce clean and renewable energy. Yes, Al Gore’s ideas on relying on sun and wind will not produce enough energy for the U.S. but it is a start and if that is combined with nuclear energy. That will reduce our carbon footprint and dependency on non-renewable resources significantly. Cars are an issue but coal plants are worse in my opinion. Cars are evolving by themselves and in a few years seeing many turning electric or hydrogen. It obvious the demand is there and car companies are not going to lose the chance to make a killing on them. Think the first car company to produce a true and reliable, non-gasoline car, on a high production scale will rake the money in. It is not like we don’t have the technology people make electric cars in their garage. I think people need to take away from this article is the fact that maybe his idea is not possible, but it gets people thinking and points us in the right direction. Finding new oil will take time and just be stupid to invest in for the fact that it just continues the path for failure. The ability for this country not to use non-renewable resources is there and we can do it. We just need to put forth the effort and accept change is needed. "is Gore’s goal too audacious?" you ask. Well, yeah... the 10 year part is anyway. It is much easier to built a small spacecraft and execute a moon mission; the main hurdle there was scientific understanding. What we are up against here is not only a technical challenge, but the phenomonal logsitics of massive construction and materials across the nation. Harnessing wind and solar for the nation would require that the most 'resource rich' areas (upper midwest for wind, south for solar) be connected to the rest of the country with transmission lines that can carry the power. But high voltage AC lines (which we currently have) can't do it eficiently over that great distance. Therefore, the transmission infrastructure needs to be converted to high voltage DC. So not only do we have to build and install the power generation system, we have re-string much of the wiring and replace most of the substations. 10 years is unrealistic from an engineering perspective. But we SHOULD start the groundwork anyway, and do the best we can. PLUS... solar and wind are intermittent power sources. If they are the primary source of power, then we need temporary storage or buffers t hold power when it is being generated but not needed, and which can then release this stored power on-demand during peak times. No such strategy exists for this yet. But again, we need to start on that. I congratulate Michael M for pointing out that we should be living in accordance with our beliefs. However, it does not seem likely that enough of us will do that to solve the problem without strong leadership from government. I propose that those of us who already believe take Michael M's advice, while still supporting greater collective action, like that proposed by Gore. DJ's emphasis on the "free market" forces has a kernel of truth: ultimately, market forces are one of the most powerful motivators for private action. However, even Ronald Reagan recognized that government action was necessary in his time to change the way government affected those market forces. In his day, he believed that meant changing the way government worked to "get the government out of the way." However, we are here talking about a different goal, with a different solution. The challenge today is to change the way government works to bring market forces to bear on the greatest challenges our nation has ever faced. One day, the problems will be so great that market forces will respond without any help from government. The problem is, by then it will be too late. We must find ways to change the market forces before the problem is insurmountable. People like "DJ" crack me up with crap like "The Reverend Gore is irrelevant. Everyone agrees that alternatives to oil are inevitable. " Uhhh, actually DJ, until about a year ago most right wingers still mocked alternatives to oil. But thanks for finally jumping on the bandwagon... even if you don't remember doing it. I agree with Lee J Alter. Algae based bio fuels have the highest probability of becoming the energy source to replace oil with the minimum impact on the economic infrastructure and carbon footprint. Since algae fuel is hydrocarbon based, producing it is essentially just growing new oil. In the growth process the algae consumes CO2 and sunlight. It appears that, depending on the strain and processing, you can do anything with algae byproducts that you can do with oil. This includes making gasoline, plastics, diesel fuel, jet fuel, etc. When the algae fuel is burned it just returns the CO2 back to the atmosphere to be reused. Also, if you build a bioreator system close to a fossil fuel power plant it will clean up the CO2 in the stack gas and give off oxygen. This could be scaled up within the time frame Al Gore is talking about. A lot is underway in this field. It is interesting that this energy source has not been mentioned in any of the high profile talks, but there are several oil companies and some nations that have joint development agreements with algae companies. I've enclosed some generic web sites that deal with some of the aspects of algae energy. The dependency on fossil fuels is going to cripple great multi corporations as well as create further unstableness in the Global Market and further destabilize many countries. Al Gore made a Challenge – it is one that takes the entrepreneur SPIRIT that was once a core value in the US...yet it is one that requires CHANGE – Imagination – Courage – Conviction – Responsibility – and Resourcefulness. Al Gore merely provided a Challenge – to a Goal – and calls to action – to THINK and organize in ways to meet the GOAL of ending our dependency on a source of energy which is limited and seek solutions to renewable energy. Those that question the validity of the research on global warming they need some serious education because the impact is already here ! Those that support drilling off shore are those who would gain the most in economical in the short run, forgoing the consequences of the long term affects upon the Global Communities. Accept the Challenge whether you like or do not like Al Gore, and attach the attitude of it is time to change NOW! Lets solve the problem instead of backlashing and blaming....our lives require we change and that means movement forward to solutions that will make a difference by giving challenging to reach new heights. Fossil fuels are a finite resource ! Let's all work to achieve independence from fossil Fuels. I don't doubt Gore thinks what he is doing is nobel....But, he is a fenatical zelot. Follow the money..... He coninues to line his pockets as he spews fear into unsuspecting people. The story of gobal warming used to be called Chicken Little, or Crying Wolf, when I was a child. Same story...different scenario. By the way...I am a scientist, Al Gore is not. “Global Warming” and rising global atmospheric carbon levels are real! It never ceases to amaze me how unintelligent some people can be by ignoring the facts and overwhelming evidence that global carbon levels are at near record braking levels read from accent ice cores. The ever increasing number global erratic weather occurrences over past 30+ years clearly show a direct correlation between global temperate rise and Earth's atmospheric carbon levels. I fully agree with Pres Elect Al Gore and vast majority Earth's Climatologists. I don’t buy the FUD of Oil lobby funded payola-scientists and “December 20, 2007 U.S. Senate Environment and Public Works Committee (Minority) report” politicians. I don’t feel like funding Al Qaeda and flooding the Earth or worse. Remember ignorance is temporary but unintelligent is forever. We can absolutely meet the Gore Challenge. 1) #1 in replanting forests – they began this in 1995 as a response to desertification, erosion, and dust pollution. 4) #1 in producing electric vehicles – which they started about 1995 in response to their oil/coal crisis and pollution problems; China is now producing 25 million electric bikes a year and is using license fee hikes to encourage its population to switch from gas bikes to e-bikes. 5) China will also become the largest producer of hybrid vehicles within 5 years. Vehicle pollution in China is much less than in comparable Western cities because they have newer cars that meet Euro 3, 4 and soon 5 standards, and fewer cars per person. 8) China is rapidly replacing its many old inefficient polluting 1970's coal plants with new scrubbed plants – yes they build 2 new coal plants a week, but they are also decommissioning three times that number of dirty plants each week. 10) not #1 in Ethanol, which is entirely un-green and distorts food prices. The USA has more skilled workers than China, and plenty of drive. It is paralyzed by media dis-information in the grip of big industry/finance. Gore's challenge is far from too audacious- it is exactly the kind of challenge we need right now. When Al Gore actually PRACTICES what he preaches, he can tell the rest of us what to do. His energy consuption at ONE of his four mansions would power my home for 25 years. One flight in his private plane consumes more fuel than my evil, kid carrying SUV does in a year. Despite being against carbon based energy, he still owns massive amounts of oil company stock. Obviously, he doesn't really believe the fear mongering talk he spews. If he ever does, maybe he can look at a certain house in Crawford, Texas and get some ideas on saving energy. It's one thing to say we need to switch energy sources for the reason that cheap oil may be, emphasis on "may be," running out in the near future. It is entirely another thing to say we need to switch energy sources because Al Gore believes in Anthropogenic Global Warming (which is false) and that CO2 somehow affects our planet. Since 2007 no one takes the IPCC reports seriously anymore since the reports are chock full of intentionally misleading information (e.g., no more "hockey stick"). As a Canadian watching Al Gore's speech, I felt a sense of admiration and hope listening to an American politician- the first time I have felt this in a long, long time. Al Gore is right. We live in perilous times, and if America and the world are to survive, this effort is what is required. How many children have died of increased incidences of leukemia near oil refineries? What happens if you leave a car on in a closed garage? Why is China now so polluted? Why are Detroit and Los Angeles so polluted and have elevated incidences of cancer? The cause of all these problems is the refining and burning of fossil fuels. While these reasons alone are sufficient to warrant the discontinued use of fossil fuels the added greenhouse emergency nails the coffin shut on this argument. Scott, I don't know how you can sleep at night, though I am sure are sleeping with the oil and coal companies. You are probably a lobbyist who is highly paid to distort the truth. How can you look your children in the eye? You clearly don't get out much because if you did you would see with your own eyes the increasing problems associated with and caused by burning fossil fuels. We can easily solve these problems and even a morally bankrupt person like you could make loads of cash off it. The oil and coal companies have know for decades that their business causes tangible harm to consumers much like smoking cigarettes does. We should be mounting a campaign to sue them for the medical and environmental not to mention economic harm they have caused our country and the world for their ruthless acts. Oil barons have a long history of murder, deceit and terrorism. Every school kid who has studied American history knows this. They continue this legacy aided by well paid legal counsel who have no morals. website in an attempt to intimidate the general public into buying the oil, coal and nuclear power companies position. Show me any science that backs up your claims... real science not the make believe stuff you are trying to pass off on the those who can't read or understand a scientific journal. Do you have a subscription to CELL or NEJM, Scott? Are you an engineer, chemist, physicist or biologist?Nope ... you are probably a paid mouthpiece. All the scientists I know, (do you actually know any scientists, Scott?) agree with Al Gore. There are many NASA scientist (who were told to keep their mouths shut by the Bush oil administration) who have clear evidence which verify the greenhouse effect is increasing due to man. We live in ways never even imagined a century ago, and we take it all for granted; we squander resources like Coneheads, and we claim a God-given right to do so; we�ve gone two generations living on the infrastructure our grandparents invested in, an we expect it all to last forever; we feel entitled to status and a way of life we never earned. After all this, Al Gore�s ridiculous? The one constant in history is that everything changes. The petroleum economy has had its day, and now it�s ending; the oil to continue our profligate lifestyles indefinitely simply does not exist, even if we could so continue without causing environmental catastrophe. When I was a kid, nobody had ever been to the moon, and a lot of people said the attempt was ridiculous, impossible, and useless, but we tried anyway, and now there�s anthropogenic trash on the lunar surface. If we don�t face the change that�s upon us, if we don�t adapt to it, if we don�t overcome its challenges, then garbage on the lunar surface may become humanity�s most enduring legacy. The ways of our fathers served us in their time, but nobody ever planned for this status quo to last forever. Now, we�ve turned the fossilized remains of our own ancestors into smoke and other poisonous substances, and there�s absolutely no reason to believe we can go on this way for even another generation. If we don�t take up this challenge, civilization will collapse when the oil runs out, and then we�ll really go back to Stone-age living. The Middle-Eastern locals know a lot more than we do about how much oil they have, and they�re aggressively getting into the renewable energy business; if their actions mean anything, they mean that the world�s running out of oil much faster than we would like to believe, and out biggest oil suppliers are making the transition to renewables. What sort of position are we going to be in if they have renewable energy supplies when the oil runs out, and we don�t? Don't think of this as an abstract goal; think of it as a life-or-death struggle. We have to move beyond petroleum if we want human civilization to survive. We can be defeatist and claim there's nothing left after the oil's gone, or we can get to work and make the transition; what we can't do is keep civilization running on oil indefinitely. Just to be very, very clear: OIL is OVER. Enough name-calling already. That is neither polite nor productive. We need to be clear about one unassailable fact. The selection of energy sources and a course of action is about cost and cost alone. If you think that oil should be taxed so that external , i.e. environmental costs are included and you think that might work then go ahead and let your representatives know. I have my doubts that government will use the tax dollars wisely, but that's a different issue. Look what $100/bbl oil has done though, it has made solar thermal projects in CA look attractive and wind farms in TX spring up. The vast majority of you are way out of touch. As a professional energy process developer and researcher (bio-fuels, wind, nuclear, petrochem, I've spent years on most of them), wind and solar can NEVER provide even a majority of the energy we need and use, and especially within the next 10 years. Al is becoming exposed on the AGW thing, so he has to find another cause. If you have the ability to understand math and statistics, and physics. please look at the data. If you can't, you are entitled to an opinion, but please express that it is an opinion based on feelings, hopes, fears, or whatever drives you. There are exactly 2 non-carbon-based, renewables that have any hope of being implemented on a grander scale within the next 2 decades, regardless of new discoveries or new technologies, regardless of whether you throw all of your income (not mine) at the problem or not, and they are not in vogue with environmentalists, and both have major political roadblocks (not technical ones): hydroelectric and breeder-reactor nuclear technology. Adolf Hitler, a starving Austrian soldier, rose to power and converted Germany from its worst economic depression to a major world power capable of taking on an alliance of nations in only 13 years. Roosevelt commanded an infrastructural change to build roads, bridges, and dams that revitalized our workforce, our economy, and the morale of the nation in less than 2 decades. Clinton brought us out of a recession and into surplus by embracing the technological age in only 8. After 40 years of struggle, George H. W. Bush negotiated an end to the Cold War in less than 4 years. George W. Bush, in less than 8 years, has managed to wrack up $7 TRILLION in debt (and rising) – and that money includes coordinating over 250,000 troops, equipment, supplies, etc, and it includes rebuilding infrastructures in two countries – bridges, roads, etc. CLEARLY the United States is capable of a) coming up with money, b) coming up with workers, c) executing a plan in less time than it would take to do R&D on drilling. When America wants to do something, we do it. There is NO reason this goal is unacheivable. It is just as achievable as every other plan out there, including the truncated timeline as compared to every other plan, except this plan actually makes sense because it will directly benefit everyone in all ways we are hurting – hurting for jobs, for gas, and for environmental action. And for the record, I love Al Gore. And for that person who said Al Gore was a jerk b/c he wastes resources, FYI – the person who writes the book on tree planting is killing trees via the book – but because of him, more trees are planted. Therefore, it's worthwhile. Likewise, the man burning carbon fuels to make it to his Nobel prize ceremony in order to let the world know we all need to take action is creating action - big action, from many countries, and cities, despite the U.S.'s failure to take the lead globally - so doesn't that counterbalance his plane ride? If you are serious, you must believe we should never recycle b/c we exhale carbon dioxide, and since that means we pollute the air, we should not try to reduce the amount of useable material in landfills. the polar bears are endangered. the north pole will be without ice during summer and all we can say is drill more oil. Can people really be that stupid. Jason, you forget how much the war in Iraq has cost the American taxpayer...I'd rather see my money go into R&D for alternative energy than fighting an ill-conceived and poorly planned war. One point five trillion seems like a drop in the bucket! How to prevent glaciers, crops failing, people starving. Seth, can you point out *one* reputable scientist who claims Global warming is not caused by humans. Your claim that "most" scientists say so is not merely absurd, it shows rather serious illiteracy on your part. As does your perception that Gore supports alcohol as fuel. What part of "carbon free" in his challenge didn't you understand? Or do you believe alcohol is carbon free? At least he is doing something good now. Environment Effects of Increased Atmospheric Carbon Dioxide. I think All's Gore comment regarding renewable energies are achieveable and that USA could be completely independent of foreign oil import in the next ten years. The future of energy in USA and world lies in the electricity. In the future there will be more and more competition for oil. China. India and Russia will have much more cars and the price of oil will keep rising,although during recession it might go the price of oil somewhat down. The USA has vast land resources, where the wind and solar energy might be utilized. One of such land resource is unutilized land in the highway system. The USA has thousands and thousands miles of highways. Along these higways could be built wind turbines and solar pannels. The beuty of this approach is that the generated electricity could be be collected and tranported through a cable along the highway and imediately utilized for cars and tracks in charging station similar to the current gas stations. In California they have so called hydrogen highway. Why they couldn't be electricity higways in the rest of USA? An additional benefit would be that the infrastracture such as bridges etc. could be fixed during the construction of wind turbines and solar pannels. States such as Michigan and Ohio could have manufacturing facilities for the wind turbines and solar pannels and replace manufacturing jobs which they lost in the past and recently. Al Gore has the money, large number of supporters, ideas. Gore for it ! Build a 6 megawatt wind turbine, Solar Panels, Solar Stirling. Don't be like the Pope, trying to increase the fold. Lead by example ! Using Methanol as an energy carrier, we could retain the existing infrastructure, use it "conventionally" in combustion engines as well as use it in fuel cells (even hybrids running on the same fuel). Yes, that is the beauty of Zubrin Methanol plan. All new cars Methanol enabled for extra $10. Methanol the every waste.Is the new battle cry. Maybe even eliminate the garbage man. Regarding Bill's idea to to capture CO2 from air, is OK, but the CO2 in air is diluted. Wouldn't be better to capture CO2 from "coal" Power Plants? However even with this aproach, there would be quite waist in energy to use electricity from wind turbines to use it for manufacturing of Hydrogen . Why not use the electricity to power directly electrical cars or hybrids? Gore refuses to embrace the only renewable green technology that has ever been proven: nuclear fission. Fifty years of impeccable safety, far safer than every other energy production and generation means, is not enough for Gore's transparent political agenda. Sure, Gore allows current nuclear facilities to continue to operate in his manifesto. He knows that as America's energy needs increase, and the nuclear facilities age without allowing replacement, green renewable nuclear energy will fade from existence. America generates just 21% of its total electrical output by nuclear fission. In lowly France, it is a progressive 78%. And France reprocesses and recycles its nuclear "waste", so there is virtually no need for any long-term storage. Outrageously, the Carter administration outlawed nuclear reprocessing/recycling in 1979. It is still illegal today. Don't be fooled by Gore's politics. Call your congressman. Demand off-shore drilling now. Demand nuclear power now. Demand nuclear fuel reprocessing and recycling now. Demand energy independence. Now! Ok, Bruce, here are your stones. Breeder reactors, transmutation, and other transuranic-recycling technologies were banned in the US for the very simple reason that those technologies have an annoying tendency to produce weapons-grade fissile materials. That's a proliferation issue, and the concerns over it aren't going to go away, even if they mean economic collapse. The powers-that-be are just way too scared of generating gobs of potential weapons material to even consider allowing it to occur. Hydroelectric is fundamentally a power-storage technology. somebody with a sufficient power and a pair of vertically-separated reservoirs could make hydro into a very effective large-scale power storage mechanism, but the naturally-available supply of hydroelectric power is quite limited, and we're already exploiting the bulk of it. Since increasing the available supply of hydroelectric power requires gaining control over the distribution of rainfall, scaling hydro up to meet demand is not really all that viable. I hope you can expand on that "exactly 2" notion you have, because one of the two just won't work, and the other's politically infeasible to a profound degree. The argument you don't make regarding the non-viability of wind and solar sources might have been interesting, but you didn't make it, nor did you cite the literature on which you base your opinion. Incidentally, I assume that you're not the same Bruce who was previously commenting in support of Gore and pushing hydrogen earlier in the discussion. Hydrogen, like hydroelectricity, is fundamentally a power storage potential, but significantly less efficient at storing power than hydroelectric solutions. Extending the topic just a little, maybe we should consider that CO2 isn't the only greenhouse gas we emit in large quantities, nor is it the the most potent. Methane, for instance, is a greenhouse hazard at much lower concentrations than CO2. Maybe we should discuss retro-fitting municipal sewage treatment plants to capture and conserve the methane gas they produce during their operations, which could serve both to reduce atmospheric methane emissions and to provide a supplement to our supply of natural gas. There is no doubt that the sun is the life source of the universe. Harnessing this power is finally coming to fruition however the average homeowner/consumer really does not possess the knowledge to make this happen. I would like to see more educational shows and documentaries about households who have successfully implemented solutions to decrease their carbon footprint and their dependence on fossil fuels. Check out this unique ebay attempt at educating the public on how solar can be used. The key to the Hydrogen Economy is presented below. Water is broken into Hydrogen and Oxygen when it comes into contact with an alloy of Aluminum and Gallium. Thus Hydrogen can be made on demand by pumping water into a reaction chamber containing the alloy. An automobile can use a tank of water rather than a tank of gasoline. Here is the equation: 2Al + 3H2O –> 3H2 + Al2O3 + heat. I can only offer this to everyone out there. If you all believe that this cannot be done then it will never happen. In the 200+ years that we have been a independent country think of what we have done and accomplished done and invented. Tell me what other country has put a man on the moon, and that was when I was 12 years old. NOONE NO OTHER COUNTRY! The problem is we keep giving things away, our jobs, technogoly, businesses, all for countries to use to eventually strangle us to dependency on them for energy. A sad damm country we are! Ed and how do you regenerate Al2O3 back to Al? "Just to be very, very clear: OIL is OVER." Goole "Turning Coal Into Oil"
If USA has not the skills, not enough second World War German immigrant chemical engineers – ship the coal to China, and have China liquefy for US. Sorry, anyone who goes around likening their own hot air to famous speeches is all about tooting their own horn. Al has been doing this since way back before he invented the internet, which BTW, is one of the larger causes of increased US power consumption. Thanks again for the internet, Al! I'm going to do my part. I'm going to Pennsylvania, to an Amish Buggy dealership and order a brand, spankin' new, shiny, black buggy; and, a 2-year old Morgan to pull it. I will go to bed at sundown and rise at first light...every day. I will do all this so that "big Al" can have my share of energy to power his home in Kentucky. I will sacrifice all I can to make my life as miserable as possible...so "big Al" and his adoring environmentalist friends will feel good...really good ! Another false prophet, sold his soul to GreenieBub, the Devil of Death ? Out to smack down the Green Pope, and his Green Guardian Angels ? "Penny saved is penny earned." The truth is nothing can be accomplished if we don't try. What if we only succeed by 50%, at least we will have tried and 50% is better than nothing. Yes, we went to the moon in less than a decade and Yes, the country has been brought to ruin in less than a decade, so why can we not regain our former glory in less than a decade. Are we truly a nation of whinners and nah-sayers or are we willing to roll up our sleeves and get something done? To heck with what the rest of the world does, let us be the ones that sets the pace. The world has always, until the last seven plus years, looked up to America as the beacon of light in the fog. Are we as a nation going to turn out the light or are we going to show the way. Yes, maybe the goal is not possible, but what if it is? I have been taught two things in life; 1. Can't can't do anything and 2. Aim High. 'Nuff said the rest is up to you. "The truth is nothing can be accomplished if we don’t try"
Perception may be a false reality, inciting to Mob Action. Misappropiating the earned dollars of others, to build an inefficiency ? Even Al Goracle wants you to pay for his dreams. Regardless of whether carbon emissions are the cause of climate change, everyone agrees that our national security and economy is at risk as long as we are dependent upon oil imports. I think it is also safe to say that everyone agrees that emissions from vehicles and coal fired electrical plants make our air and countryside dirty and stinky-something I could live without. It is my understanding that research has shown that the total known untapped oil reserves within the US and its coastal areas are grossly insufficient to supply even our current demand. With all of that said, additional investments in proven and nonpolluting alternative energies must be helpful for energy independence, national security, economic growth and technological leadership. I believe that the united states generally has become complacent. This includes government and the public, in my opinion. I would gladly pay additional income tax if those monies were applied to real solutions to solve these issues and return the united states to the proud, responsible and compassionate leader it once was.
" united states to the proud, responsible and compassionate leader"
Newer was, nor will be. Nations have interests, not morals. Good summary of US, as perceived by others, is the Bill Maher Kasparov interview. US uses democracy, human rights, when suits international policy. Dictators when cost effective.. Goes to war to make money. Search for United Fruit. Similar attitude, a continued policy of exploytation ? That being said, We need the oil, Soudy Arabia is a dictatorship, has oil, Two ducks are lined up. US troops are conveniently nearby. 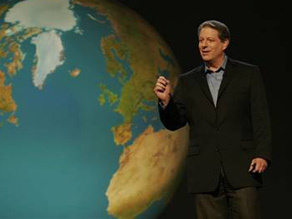 Forget Burma, no oil, the Nobel prize winner there, is not a compassionate, prophet of Utopia, Saint Al Gore. I admire Mr Al Gores ideas. However, when he can reduce his energy consumption equal to mine and everyone else's I'll believe him. He is currently using 3.5 to 4 times more enegy the we are. That is based on square footage of his home. He will have to unscrew a few more light bulbs. And his utility company is cheaper per kw than mine. John McCain, what in the world can one do with a guy like this. He constanly misstates facts. Yet he rambles on day after day as though his multiple gaffes and mis ques are of no effect. From the former Czech Republic to accusing Barak Obama of wanting to lose a war for political gain, a very offensive accusation, to accrediting the ease of conflict in Iraq solely on the surge, forgetting or deliberately omitting the Sunni decision in expelling the insurgents from their territories and the laying down of their militia’s arms months prior to the surge. Then blaming Obama for the high gas prices as though the American public is stupid and will follow suit with that preposterous train of thought. He must think we are a bunch of imbeciles and idiots. That statement really insults all of our intelligence. We all know why gasoline is so high, and its not because of the lack of drilling within the United States or Obama. Oil speculators for the most part are responsible for the rising costs of oil. Besides, any benefit from drilling domestically won’t manifest itself until at least a decade from now. By the way, McCain was once against drilling and now for it. He also voted nay for keeping that oil for American citizens and instead wanted it for sale outside the of the United States. Yet, here he is acting as though he always had the American people’s best interest at heart. A very deceptive position. And the odd thing about it is that a lot of misguided people will believe him. Out of curiosity, I just wonder how many people actually believe that nonsense. He and his campaign accuse Barak Obama of flip flopping on issues when in fact McCain has flipped flopped on countless issues during each of his presidential bids, including this one. A number that easily reaches past fifty and getting closer to one hundred. If I were more guilty than the next fellow of something, I would certainly be the last person to bring that something up. In one of his town hall meetings he claimed he had no problem with gay marriages, then only eleven minutes later stated he did not feel that those marriages should be allowed. He at one time didn’t want corporate taxes then turned around and said he did. The list of his flip flops is endless yet he accuses Obama of flip flopping. John ‘the expedient’ McCain is the reigning king of flip flops, without a doubt. Does he think we are stupid? Does he not know that there is a multitude of sources that can be checked to determine who exactly is the flip flopper, and on what subjects the flip flops occurred? Does he hope we don’t have the internet or blogs or access to all of his past statements on the multitudinous subjects he’s flipped flopped on? Or does this guy just says forget it, I’ll say it anyway, torpedoes be damned full steam ahead? To hell with the facts, if it sounds good then say it. Is he counting on the majority of us being so bigoted that we’ll vote for him no matter what comes out of his mouth? Then his co-chair of his economic polices, Senator Gramm, calls us a nation of whiners. He seems to surround himself with other out of touch people who for all appearances seem to have a great apathy for the suffering of the American public. Corporate interests are apparently rule supreme. By the way, this same Gramm character is responsible for the deregulation of financial institutions and well as the deregulation of the oil speculators, thus higher gasoline prices. Duh! There are so many problems with John McCain that it is impossible to list every single thing in this comment. All I can say is check it out for yourselves and see if I’m not telling you the truth about this candidate. It seems that he will say and do anything to get elected whether it is true or not. The title John ‘the expedient’ McCain fits him well. His willingness to use whatever tool at his disposal to attack Obama. For example; McCain used Obama’s recent trip to the holocaust memorial in Israel as an occasion to expound his political views. There’s absolutely no boundaries. It just goes to show how low and desperate this guy is. This is a definitive statement as to his lack of character and morals. Nothing is off-limits for him, absolutely nothing. And then to make disparaging remarks about Obama’s visit to Berlin. To be honest after years of feeling Europeans hated Americans it was refreshing to see all the American flags waving in the crowd. This whole week McCain appears to have a serious envy problem to the highest degree. I can’t recall one disparaging remark made by Obama when McCain went to Canada and made speeches and went to South America recently. It shows a vast difference of character. So with that said we come to the consternation of the Republican party, with their choice of a presidential candidate. They are stuck with him for better or worse and each day that passes it looks like worse. Now, with all these things wrong with this guy, if he gets elected in my opinion it will be for one reason and one reason only, and that is we are still the prejudiced, bigoted nation we have always been. And apparently it will remain that way until Jesus comes, much to our discredit. Just a nation of a bunch of irrational, tried and true racists. I can just imagine the RNC wishing that they had another more viable candidate instead of this bumbling, stumbling, confused man who is constantly in need of coaching while even speaking. I wouldn’t be surprise if at their convention they decided to supplant McCain with someone more formidable. Someone who can remember from one day to the next what the hell comes out of his mouth. Come November, we have a chance to do something astounding and magnificent and elect a black man as president of a country that fought so hard to keep the institution of slavery alive. So hard a fight in fact that 600,000+ people lost their lives because of it. Humm, which choice will you make??? Cosmetic difference, which talking head you select. Catherine Austin Fitts is a good read. International or Isolationist version please ? Weight loss, financial, for all. Holding together the Global Empire. I think a good way to start would be to give an incentive to malls in this country to place solar panels on their FLAT roofs. How many thousand acres of solar panels would that be? They may not get off of the grid entirely but it would have to be an enormous reduction of their footprint. Other countries seem to be able to come up with alternatives what is our problem??? Perhaps a government that is owned by special interests and feels the need to protect them and not the people they took an oath to represent. We can also work with wind it doesn't have to be an all or nothing solution. As far as I know we are all staying on this planet, no one I know has figured out a way to get off or has found another planet to relocate to, so we had better get moving. ou did a satisfactory profession creating a libretto in return photographers like me with no face with stock. You explained so much that I needed to know. I con it with consuming interest. You are a superior writer. I’m on a-one of the life to entertain met you and skilled in that you are as useful and clubby as your oeuvre indicates. Your mending is appreciated. I have been exploring for a little for any high-quality articles or weblog posts in this sort of house . Exploring in Yahoo I finally stumbled upon this web site. Reading this information So i am happy to exhibit that I have a very just right uncanny feeling I found out exactly what I needed. I most unquestionably will make certain to don?t fail to remember this site and provides it a look regularly. With luck , the particular 8-10 measures in the list above can help alleviate your own hangover when getting on with your day. Don't forget to add leave your belongings you don't think are very important. This is the financed chat compiled by me on behalf of Zillion Parents Problem. The actual views along with wording are common acquire. Tournament operates September Nineteen for you to March Of sixteen, Next year. The haphazard winner will likely be released by simply March 18, Next year. This already been prolonged considered that booze causes the discharge invosalomon mening naturally occurring opioids inside the brain incentive facilities, however reports have reported how this process performs merely throughout wildlife. A new paper inside the journal Scientific disciplines Translational Remedies gives experience straight into why booze is really so addictivein human beings. Delicious Fashion is definitely an more popular then ever model of apparel. You are able to for marketing tracksuits which can be made of terrycloth. Next to your skin other pursuits, like formal wear, informal use, equipment, luggage along with footwear. Delicious Fashion has its own retailers along with retailers, nevertheless, you could also purchase a selection of their products coming from department stores, like Bloomingdale's, Neiman Marcus along with Saks 6th Opportunity. You can also buy cheap Delicious Fashion products coming from different internet sites online. Some of the goods that you will see over the internet are generally expensive jewelry, bracelets, timepieces, tracksuits, gowns, pants and much more. You can even sign up to your Cheap Fashionista Publication to enable you to obtain information on how it will save you income whenever you obtain Delicious Fashion outlets. You can get totes, anklet bracelets, jewelry, bracelets along with diamond earrings. Every item that you're going to locate over the internet have got discounted prices. This is a excellent website which you could purchase equipment to choose your style. Some of the brands along with developers you will have over the internet are generally Abercrombie, Delicious Fashion, Erectile dysfunction Robust, Armani, Dolce along with Gabbana, Diesel engine, Alfredia Dior along with Indicate Jacobs. It is possible to get luggage, denims, equipment, sweaters and much more. But like every great personal privacy paranoiac, Kilpatrick can certainly envision the way the facetracking application he or she carries can be used significantly less charitable reasons. Thus pertaining to their Ignite New york chat, he or she done a series of findings to discover exactly what sorts of covering tactics can easily conquer a common face identification algorithm called Eigenfaces, screening the offtheshelf setup of the algorithm in a system known as Neurotechnology. Four. See or even browse the information: Search, browse the document or your understanding of what's occurring in the world, young ladies as a guy with some information.